Bvlgari will launch Magnolia Sensuel, a new addition to the Splendida collection. 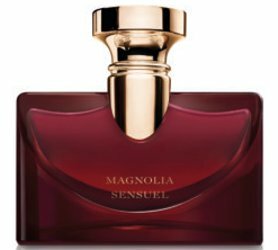 Magnolia Sensuel is a floral chypre and was developed by perfumer Jacques Cavallier. The notes include citrus and magnolia. Bvlgari Splendida Magnolia Sensuel will debut in January, in 30, 50 and 100 ml Eau de Parfum. I don’t have much faith in Bvlgari but I would still try this. I will try nearly any magnolia, because eventually someone has to make a good one, right? I also love the flower but I too have yet to find a great magnolia fragrance. My two favorites are Sud Magnolia and Magnolia Nobile but neither capture the creaminess of a magnolia. That bottle color would be great for a lipstick. Yes, I love that color!